Give a camera to a boy or a girl and sometimes, when you look at the results, you will get a big surprise discovering some new photographs that you would never, as an adult with a much more re-educated look, have done; and you envy them for not having that freshness, that natural daring look and so freedom. Xavier Miserachs tells us in his book “Criterio fotográfico” (N-1): “During the Summers of 1966 and 1967, an atypical experience motivated by the (failed) attempt to round off incomes. With a local partner-friend, totally alien to photography, we set up an establishment in a small town at the Costa Brava to provide material and darkroom services to holidaymakers and tourists. The meager business volume achieved made it advisable to forget the initiative, but the experiment offered me reasons for reflection worth considering. Except for some specialized black-and-white work, the darkroom service was provided by an industrial company that served the entire area which allowed us to 24 hour deliveries. In the days following the opening I reviewed the copies ready for delivery for a strict quality control, and discovered with great surprise that doing that was exciting. The technical quality was quite deficient, the use of reflex cameras with incorporated photometer had not yet become popular and neither auto-focus nor incorporated flash were known, nor emulsions and the developing and printing processes gave the performance that will achieve in a near future. But among the innocent productions of my clients, there were images where to stop, photographs that aroused a certain envy in me, that I would have wished were mine. The amateur production provided in-depth documentation of how my tourists spent their holidays, showing an uninhibited repertoire of sociological attitudes that would hardly have been captured by a professional photographer. I came to be passionate, to wait impatiently for the daily distribution, to suppose “styles” among my clients with short pants or pareu over the bikini, totally foreign to my speculations, and to whom I attended with the maximum face of poker. It is not the intention of this article to give amateur photography an automatic award for the simple fact of getting out of “inexperienced” stares; many amateur photographs are quite difficult to digest. But I think that to recognize the value that Xavier Miserachs attributes to it, who has rarely been credited, is interesting and beneficial for Photography as a whole. Of course, to speak of amateur or amateur photographers is to speak of a very heterogeneous group, with many levels of capabilities. It is a group, such as Miserachs’ tourists, do not have neither eagerness nor pretensions to be recognized as photographers. Let’s imagine for a moment all those photographs that are sleeping in family albums and to which only a very small group of people have access; very possibly we are talking about tons of photographs produced by photographers who are not photographers. If in some way we could visualize, organize and study them maybe they would give us as a result a whole new photographic genre very interesting to analyze as a whole. And going back to the words of Miserachs, perhaps they would explain to us better than other sources who we have been. Tomàs Cervera i Cocerch “Chez Tomàs” was a pioneer of the Costa Brava tourist industry, a great public relations and the first tourist animators in the sixties. An emblematic adopted Palafrugellense, who died at 72 in 2003. In the book Chez Tomàs, written by his daughter Mariona Cervera, (Col. Quaderns de les 7 Sivelles, CCG Edicions, Girona, 2006), on page 62 we can see a photograph of the entrance to the Labo-I shop by Xavier Miserachs and Tomàs Cervera in Llafranc. In the image we see the famous inseparable parrot of Tomàs Cervera who was the protagonist of a hilarious scene one day that escaped, as it is explained on pages 61 and 62 of the book, according to the testimony of Miserachs..
For those of us who have lived through that period of Photography in which we took our film rolls to be developed at the shops in our villages, imagine what it would have meant for us if behind the counter we had met, no more and no less, a whole Xavier Miserachs giving us our copies and, without our knowing it, who would have reviewed our photographs with his “Photographic Criterion”, without a doubt a luxury. (N-1) Photographic criterion. Notes for a photography course. Xavier Miserachs. Ediciones Omega, S.A. Barcelona. 1998. (N-2), (N-3) and (N-4) Llafranc, Tamariu and Calella are seafaring districts that belong to the municipality of Palafrugell (Girona) and the Costa Brava. Photo: Private collection of M. Luz Cámara. 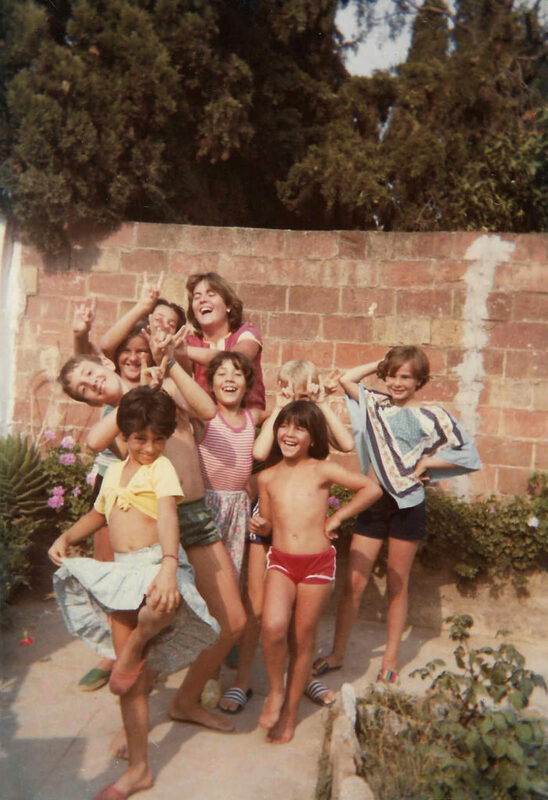 My sisters, my cousins from Madrid, and me, in the centre, some summer of the eighties in Palafrugell (Girona). When my cousins used to come we used to go to bathe preferably to the beach of Llafranc, where a few years before Miserachs and Cervera had had their Labo-I Photography shop.